袁慧雅, 高利娜, 刘国杰, 徐恩宇, 刘俊亭. 基于气相色谱-质谱法的动物类中药材中1-甲基海因分布研究[J]. 中国医科大学学报, 2018, 47(5): 402-405. YUAN Huiya, GAO Lina, LIU Guojie, XU Enyu, LIU Junting. 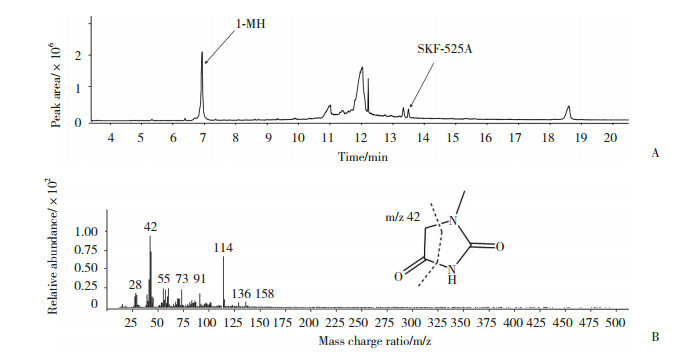 Gas Chromatography-mass Spectrometry Study of the Distribution of 1-Methylhydantoin in Medicinal Materials from Animals[J]. Journal of China Medical University, 2018, 47(5): 402-405. Abstract: Objective To establish ahigh-performance liquid chromatography(HPLC) method for the determination ofthe distribution of 1-methylhydantoin(1-MH) in eight medicinal materials from Chinese animals. Methods The HP-5ms capillary chromatographic column (30 m×0.25 mm, 0.25 μm) was used. The oven temperature was initially set to 60℃ for 1 min and then heated to 260℃ at a rate of 20℃/min. The inlet temperature was 265℃ and the ion source temperature was 230℃. Thematerials oviductusranae, zaocys, hydrophis, pheretima, scorpio, asinicoriicolla, and hominis placentawere analyzed. Results A good linear relationship was obtained in the range of 0.1-100.0 μg/mL, with a correlation coefficient of r=0.999 2.The average recovery of the method was 96.82%(relative standard deviation:0.9%). 1-MH was detected in the head, spine, skeletal muscle, limbs, skin, and tail of gecko at 0.74, 1.21, 4.04, 1.28, 0.84, and 40.28 μg/g. The content in oviductus ranae, zaocys, and hydrophiswas 4.45, 2.84, and 10.43 μg/g, respectively. Conclusion This method can accurately determine the content of 1-MH in medicinal materials from animals. These results may demonstrate the common basis of the pharmacological activity of gecko, oviductusranae, zaocys, and hydrophis. 国家药典委员会. 中华人民共和国药典一部[S]. 北京: 中国医药科技出版社, 2015: 255-256. LAUNAY M, POTIN D, MAILLET M, et al. Hydantoin compounds useful as anti-inflammatory agents[P]. US, 2002143035. 2002-10-03. WYSS M, KADDURAHDAOUK R. Creatine and creatinine metabolism[J]. Physiol Rev, 2000, 80(3): 1107. GOODNOW R A, KANG L. Hydantoin-containing glucokinase activators[P]. CH, CN1427838. 2003-07-02. 陈冰, 王诗涵, 徐阳, 等. HPLC法测定脱脂林蛙油胶囊中1-甲基海因的含量[J]. 黑龙江畜牧兽医, 2014, 5: 196-197. 顾剑萍, 林乾良. 乌梢蛇的药理研究初报[J]. 中国现代应用药学, 1986, 3(4): 4-8. 南北朝雷敩. 雷公炮炙论[M]. 上海: 中医学院出版社, 1986, 74-75. 商壁. 岭表录异校补[M]. 南宁: 广西民族出版社, 1988, 168. 胡绍兰. 尾全蛤蚧与无尾蛤蚧体活性比较[J]. 北京中医, 1996, 5: 37-38.